Each of the 200 sponsored kids receive a brand-new Christmas outfit, just their size...and a Bible, too! "Only one chair per kid in Sunday School...except for Arrbane, that is!" Our Sunday school class lacks chairs each Sunday morning, so rules must be followed. But there are occasional exceptions! Arrbane's foot was in a cast, propped up on a chair while I taught his Sunday School class. A scar was across his face, yet he listened intently, as if he cherished every moment of his newfound existence. He had almost died just a few short weeks earlier. "OK, Paul, then you can count on me for that $100. I might have told you about the story of the 13 year-old girl who ran in front of my car in 1992, and how I am convinced God intervened in quite a miraculous way to make everything come out well." "I'll be a Sunbeam for HIM!" 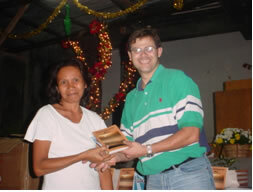 200 Bibles in the Cebuano Language & devotional guides are distributed to the poor during BLC's Christmas celebration. You point with your lips! "Dear Lord, please bless this new direction you are heading us in!" After much prayer, our church board decided to have worship services every Wednesday night in 5 strategic locations: people�s homes. This was partially to alleviate the difficulty of transportation to the church late in the evening on dangerous loose-gravel roads. DO YOU HAVE A CHRISTMAS PROJECT? Paul: I hope you know how very much we enjoyed your visit and how wonderful it was to meet your lovely family! I'm glad you're back home, safe and sound, and Look forward to seeing you again before too long.